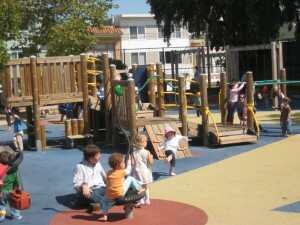 The outdoor playground at Upper Noe Recreation Center was the beneficiary of extensive renovation from 2007-2008. The playground has structures for different ages, a sand pit, plenty of benches for caregivers to watch and relax as well as new bathrooms. To maintain the quality of this space, it is the community’s responsibility to take care of the park. This includes discouraging children to move the sand from the sand pit, respectfully playing on the structures, calling out various issues to Rec and Park staff before it deteriorates, and in general helping to keep the park clean. Also, do not miss the unique installation art on top of many of the posts around the park. These were created by Troy Croliss. If you have any questions or concerns about the outdoor playground, you can either contact SF Rec and Park or the stewardship committee of the FoNVRC. If you have any questions or concerns about the playground, talk to staff in the rec center office and/or contact Friends at info@noevalleyreccenter.com. This is your park, so never hesitate to get involved by voicing your concerns, keeping a watchful eye or volunteering.